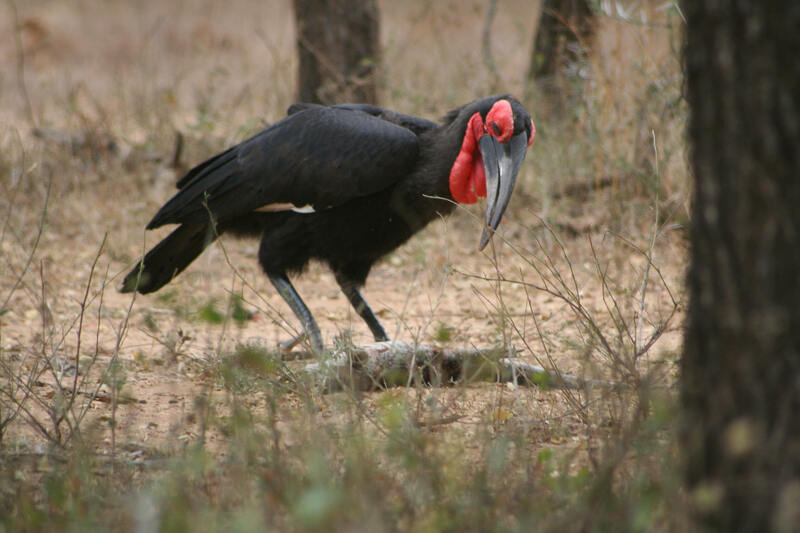 The Southern Ground-Hornbill is a Southern African bird that belongs to the Bucerotidae bird family group which includes birds such as Typical hornbills. The description for the Southern Ground-Hornbill (Latin name Bucorvus leadbeateri) can be found in the 7th Edition of the Roberts Birds of Southern Africa. The Bucorvus leadbeateri can be quickly identified by its unique Roberts identification number of 463 and the detailed description of this bird is on page 158. 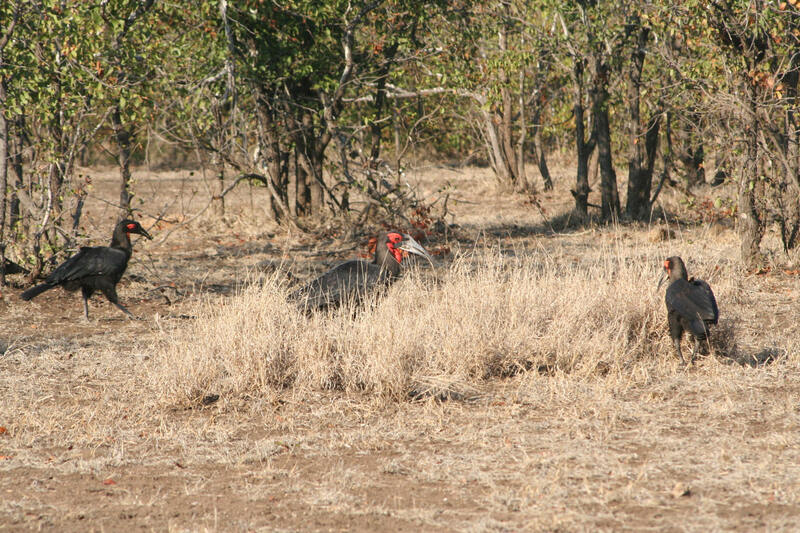 You will find a picture of the Southern Ground-Hornbill on page 160.
. There have been no changes in the Latin name for the Southern Ground-Hornbill between the Roberts 6th and Roberts 7th Edition. 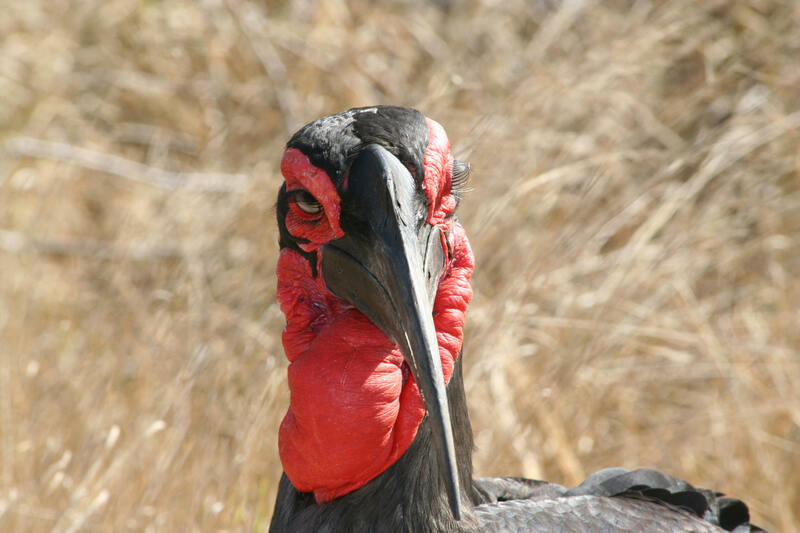 The Southern Ground-Hornbill is known in Afrikaans as Bromvoel. The Southern Ground-Hornbill has a height of 130 cms and weighs around 3300 gms. The head is coloured black while the bill is coloured grey. The Bucorvus leadbeateri has a red coloured throat, black legs and a black coloured back. The eyes are yellow. The male Bucorvus leadbeateri has physical features that are slightly different from the female bird. The Southern Ground-Hornbill is a monogamous bird which means that the bird finds and breeds with one partner for the rest of its life. The bird lays between 1 to 2 eggs and they are coloured white. The SOuthern Ground Hornbill occurs in small family groups!